This month marks the one year anniversary of willtravelwithkids. I’m so glad, after the encouragement of several friends, that I started recording our family adventures. My most faithful readers are my mom, mother-in-law and several aunts. Of course, they have a deep personal interest in our family. But I’m thankful for all my readers, particularly those who may have been encouraged to try something new or do something out of the ordinary as a result of reading the blog (like change your baby’s diaper on an ancient altar). The blog below was originally posted in May 2012 and was instantly my most-read post. I hope you enjoy reading it again. As all parents who leave the confines of their home with their toddlers are well aware, adequate facilities are not always available for taking care of necessities. Many a parent can relate an experience where they were forced to change a diaper with the baby squirming on their quads, squat-leaning against a bathroom wall. I’ve changed diapers huddled in a corner behind rows of empty airport lounge chairs, on the floor. A bench in a Parisian garden once served as a changing table (not too bad, actually). Occasionally, when a bathroom is available and it does contain a changing table, it can be so disgusting I imagine the porcelain rim of the toilet is more sterile. At least they clean the toilets on a regular basis. Oh, what is one to do?! Then there are those rare moments when fortune smiles upon us and the provision of a flat, clean slab is nearly miraculous. 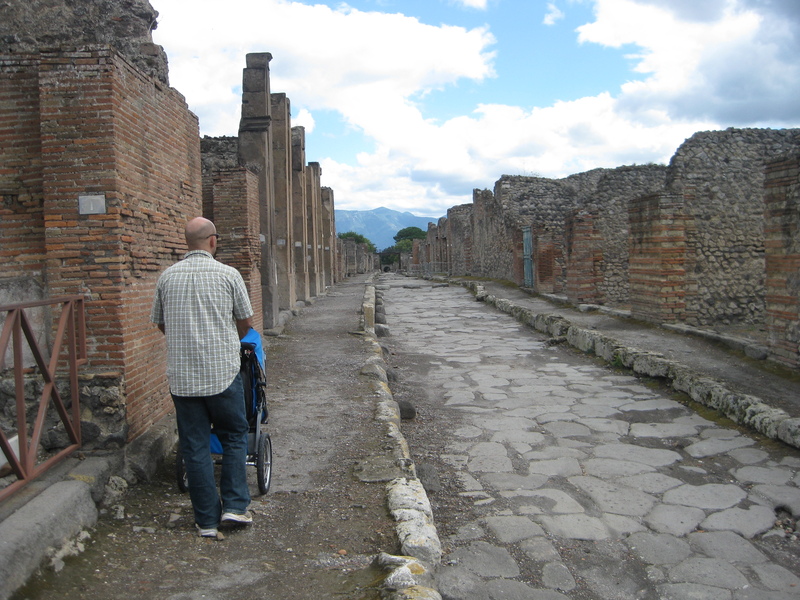 Such was our experience in Pompeii. 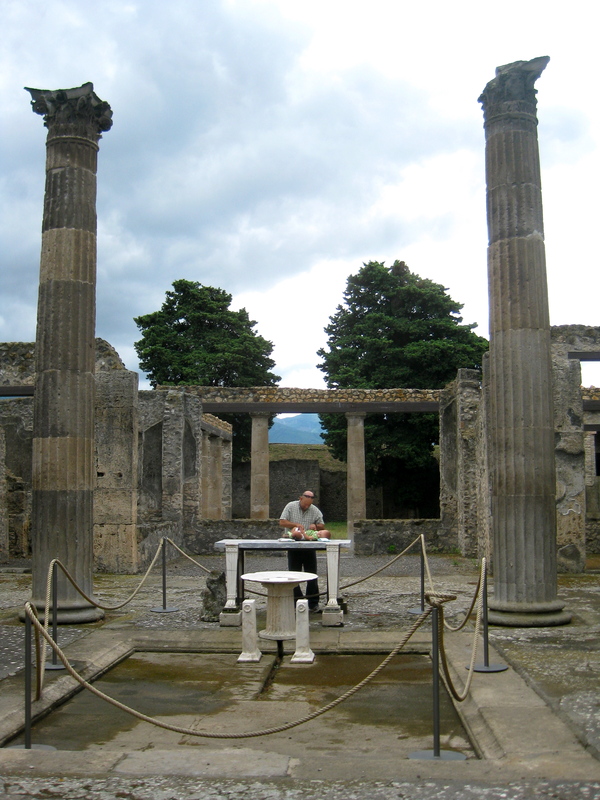 Partly cloudy and sparsely crowded, we toured Pompeii on our own one morning. We had no agenda accept “see Pompeii.” (Having no set agenda is highly recommended when traveling with an infant.) On a good day, if you wander off the main thoroughfares, some areas can be fairly deserted. A quiet, deserted area was just what we needed to take care of business. It had been a long morning and a diaper change was due. The ground was damp. No-go on a ground diaper-changing. Hmmm. As we rounded a bend and entered a temple, a beam of light broke through the clouds and illuminated the marble altar. Recall Disney’s “The Sword in the Stone”, when a young Arthur comes upon the sword in the stone. It was just like that. A miracle, ordained by heaven. The altar was accessible, dry, secluded and available for our use. It probably had never been used for such a worthy cause – ever. There, in the shadow of Mount Vesuvius, we were spared what could have been a disastrous experience. Not all have been so fortunate. I missed this last time, so glad you posted it again! Love it! Hilarious! You can totally add me to the list of faithful followers! I love reading it and can’t wait for the next one to come….I don’t even wait until I’m on the computer most of the time, just read from my phone. Oh, I’m so glad you enjoy them! That’s encouraging.